Neutrophilia (or neutrophil leukocytosis) describes a high number of neutrophil granulocytes in blood. Neutrophil are the primary white blood cells that respond to a bacterial infection, so the most common cause of neutrophilia is a bacterial infection, especially pyogenic infections. Some drugs, such as prednisone, have the same effect as cortisol and adrenaline (epinephrine), causing marginated neutrophils to enter the blood stream. Nervousness will very slightly raise the neutrophil count because of this effect. Primary neutrophilia can additionally be a result of Leukocyte adhesion deficiency. A "left shift" refers to the presence of increased proportions of younger, less well differentiated neutrophils and neutrophil-precursor cells in the blood. This generally reflects early or premature release of myeloid cells from the bone marrow, the site where neutrophils are generated. A severe neutrophilia with left shift is referred to as a leukemoid reaction. The leukocyte alkaline phosphatase (LAP) score, which refers to the amount of alkaline phosphatase per neutrophil, will increase. 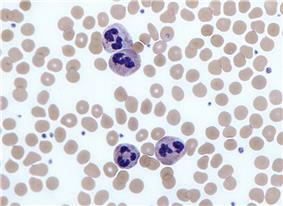 In a severe infection, toxic granulation changes happen to the neutrophils. This can resemble Pelger-Huet anomaly. ^ a b c Table 12-6 in: Mitchell, Richard Sheppard; Kumar, Vinay; Abbas, Abul K.; Fausto, Nelson. Robbins Basic Pathology. Philadelphia: Saunders. 8th edition. ^ "bloodandcancerclinic". Retrieved 10 April 2013. ^ Mohamed IS, Wynn RJ, Cominsky K, et al. (June 2006). "White blood cell left shift in a neonate: a case of mistaken identity". J Perinatol 26 (6): 378–80. ^ Shmuely H, Pitlik SD, Inbal A, Rosenfeld JB (June 1993). "Pelger-Huët anomaly mimicking 'shift to the left'". Neth J Med 42 (5–6): 168–70.